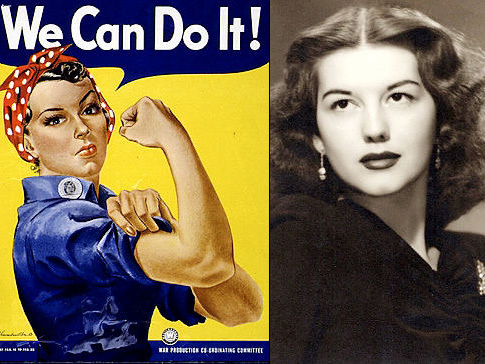 Pin-up model "Rosie the Riviter"- 'We Can Do It' poster model dies. Geraldine Hoff Doyle, the model for “Rosie,” a WWII factory worker who implored to other ladies “We Can Do It!,” passed away at 86. As a 17-year-old in 1942, Geraldine was working as a metal presser at a Michigan factory when she was captured on film by a United Press photographer. Without Geraldine’s knowledge, the image for the photo was drawn by graphic artist J. Howard Miller and used by the labor movement. Eventually 6 million women would heed the call and enter the workforce during the war years. The image of Rosie the Riveter, became an instant classic and was later adopted by the women’s rights movements of the 1960s and 1970s. There was also a 1942 song called "Rosie the Riveter" that paid homage to the women who worked during the war. Many women claimed to be the inspiration for Rosie and indeed there were film shorts and photographs that documented the phenomenon of women working on ballistics, airplanes and bombs. It later became iconic during the feminist movement during the latter half of the century. Doyle said she didn’t know that she had become so famousGeraldine was apparently not aware of the “Rosie The Riveter” poster until the 1980s when she saw her own face staring back at her within the pages of Modern Maturity magazine.